The Darling Foundry is a multifaceted visual arts centre. The venue is known as an important part of Montreal’s industrial heritage. It occupies 3,500 m2 in two adjoined former industrial buildings. Beyond its exhibitions shedding light on various artistic practices, the Darling Foundry is a living space of creation for local and international artists. Working towards the spread of current art, the centre is a true forum of meetings and exchanges. The Darling Foundry is located at the crossroads of the patrimonial district of Old Montreal and of the ever growing Griffintown. For 22 years now, the centre has been playing an economic and social key role in the neighbourhood; working actively to revitalize this industrial zone and assert its artistic identity, while keeping its architectural heritage. 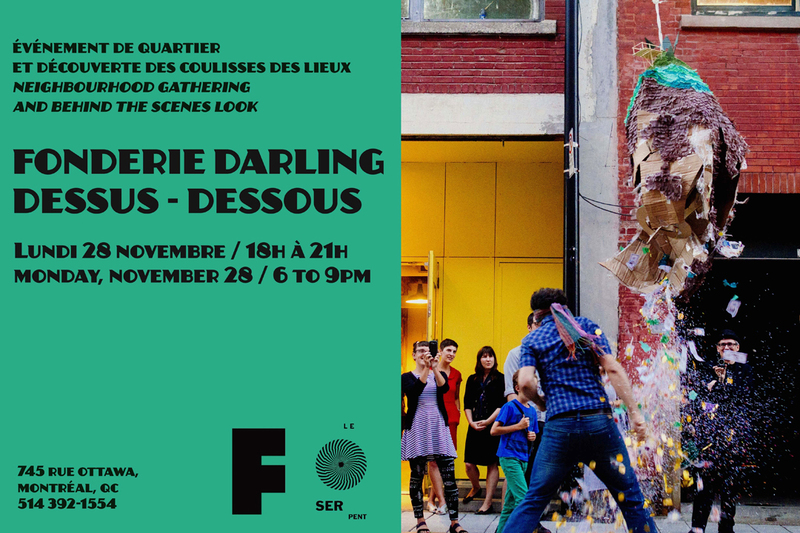 In order to bring more art in the daily life of the district, the Darling Foundry wishes to meet and greet its neighbours for a special event on Monday, November 28 at 6PM. Visit the exceptionally extended exhibition of Julie Favreau, discover artist studios, and taste special creations by Le Serpent restaurant and more. and visit of Julie Favreau's exhibition. With this special formula, extend the evening and enjoy a tasting presented by Le Serpent.